Mary, appointing him Regent until she returned. private but she stubbornly ignored the sound advice. Earl of Mar, and in February 1562 created Earl of Moray. attempt on Moray`s life by the Gordons of Huntly. his contribution and defence of the Reformed religion. the Earl of Huntly and his two sons. connived with Bothwell in yet another attempt on his life. 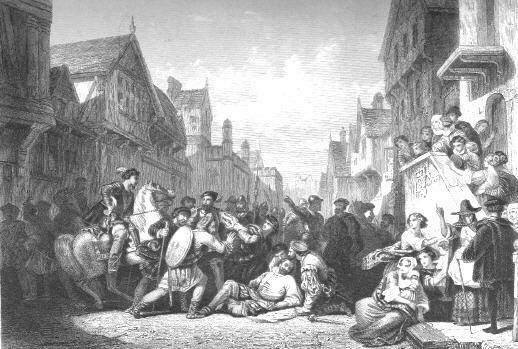 on 25 August 1567 [ a fn to Laing`s Works of Knox, vol 2 p566 has this taking place on 22 August when it was proclaimed at the Edinburgh Mercat Cross). Langside on 13 May 1568. Defeated, Mary fled to England and exile. the law for his involvement in the murder of Lord Darnley. believed Mary guilty and was supportive of Regent Moray. about him, before he died on 23 January 1569/70. in what misery and confusion found he this realm !